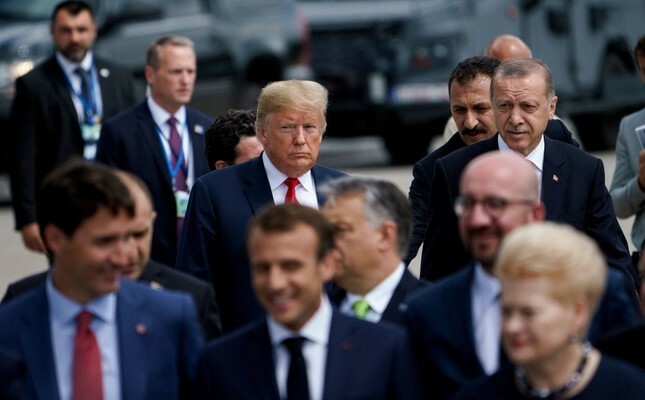 President Erdoğan and U.S. President Trump (L) follow other leaders to a family photo during a NATO summit at NATO headquarters, Brussels, July 11, 2018. COLUMNS Turkey-US relations: Quo vadis? It is becoming more and more apparent that the relationship with the U.S. will dominate our foreign policy agenda in the upcoming years. This issue is not only limited to the widening rift in bilateral relations over the recent period but essentially related to the changing strategic calculations of Washington and Ankara. The policies of these two capitals on the region around Turkey are in gradual transition. Each specific subject evolves into a new cause of tension. The new steps taken by Washington to restrict Russia and Iran and reinforce Israel's influence in the region will seemingly make a mark on bilateral relations. New problems such as Jerusalem, the Golan Heights and the Eastern Mediterranean question have emerged, whereas already present problems such as support for the PKK-affiliated People's Protection Units (YPG), Halkbank and Gülenist Terror Group (FETÖ) issues have not yet been resolved. Of course, the most heated issue of debate in the current agenda is the purchase the Russian-made S-400 air defense systems, which has reached a critical point. The approach of the U.S. Congress toward Turkey is evident. The three bills introduced by senators last week demonstrate the prevalent anti-Turkey atmosphere. A slew of negative issues to the detriment of Turkey are currently being negotiated, such as the possibility of imposing sanctions and recognition of Armenian genocide claims. Congress is evidently poised to display an approach that will target the Turkish economy and the defense industry. Also, it is quite dubious if President Donald Trump is willing, or competent enough, to prevent this negative trajectory.In fact, the S-400 issue is just the tip of the iceberg. The U.S. is highly disturbed by the improvement of ties between Turkey and Russia. Turkey's cooperation with Russia in the field of energy is not being talked about that much for now. But it must be noted that Germany confronts the threat of U.S. sanctions due to its cooperation with Russia in the fields of nuclear energy and natural gas. As known already, the Countering America's Adversaries Through Sanctions Act (CAATSA) is not limited to the defense industry. We must attach importance to possible problems between the relations of the two allies due to the ties with Russia when keeping in mind that the two allies became closer due to the Soviet threat at the end of the World War II. The U.S. should not take any steps that will marginalize a NATO ally since this would only serve Russia's objective of undermining NATO. And Turkey, on the other hand, must not be trapped in the quandary of "either U.S. or Russia" thinking, which would disrupt Turkish-American relations irreversibly. So, the S-400 tension must be effectively managed and a common solution must be introduced in the short run. Since Turkey cannot back down from a finalized agreement, a solution that will overcome the U.S.' technical security concerns must be found. Even if this tension is effectively managed, Washington-Ankara relations will still need a reset in the medium and long terms. Thus, a new approach must be formulated. In fact, the primary problem in bilateral relations is the fact that Washington does not change its asymmetric approach to Ankara and the issues thus cannot be negotiated with a common understanding between the allies whilst a reconciliation is not achieved due to unilateral impositions. Therefore, progress cannot be achieved even in several agreed upon aspects, such as the Manbij road map. Since such subjects are not resolved, areas of cooperation such as the F-35 issue are also imperiled. The character of the discussions must be changed since both parties are well aware of the fact that relations are diverging from alliance relations. The relations must be established on new and multidimensional ground and the negativities experienced so far should not set an impediment to new common strategic evaluations. To that end, the U.S. must, first of all, acknowledge the fact that it has so far neglected Turkey's security-related concerns and interests to a great extent. Washington-Ankara relations do not have to hit the lowest point before we begin mending fences.